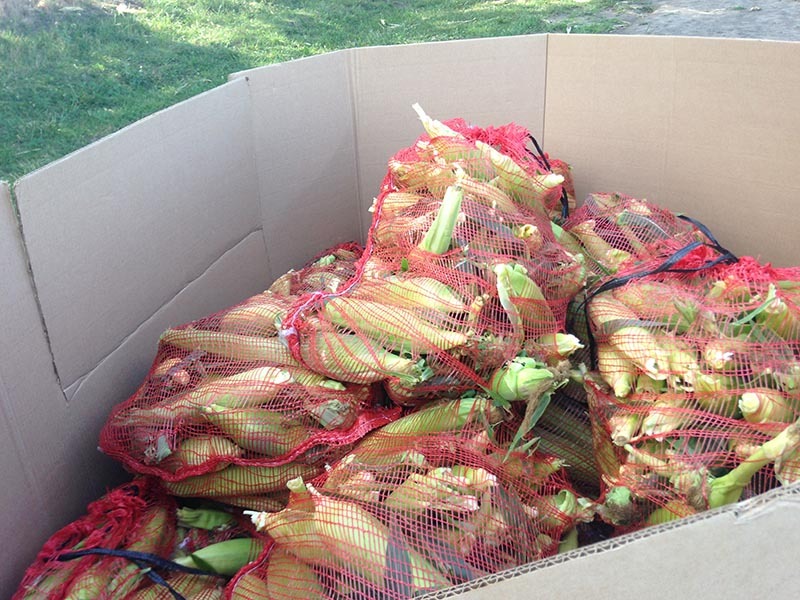 About $5 worth of seeds, the sweat equity of a Missouri couple and two grandchildren, plus a network of volunteers and caring organizations have fed the Kansas City hungry and homeless thousands of pounds of vegetables each year for eight years. With one 9,900-square foot Raymore garden and one Kansas City Community Gardens’ membership for seeds and plants, Kathy and Leo Dean look forward to their ninth year of planting and harvesting their garden that yields thousands of pounds of tomatoes, sweet corn, yellow summer and zucchini squash, eggplant, jalapeno peppers – all dedicated to Uplift, homeless shelters’ kitchens, and Harvesters’ food pantries. And Kathy’s innovation – a small stand selling some of the tomatoes for $1 per pound – has raised enough money to purchase two sorely needed commercial freezers to stretch Uplift’s capacity to feed homeless people. Kathy’s 12-year-old grandson Brayden, who followed his grandparents around the garden since he was a toddler, oversees the tomato stand that has made a difference for one community kitchen. “When Brayden starts something, he doesn’t stop,” says Kathy, who believes her grandchildren have been inspired to continue helping as they saw the importance of their garden and its produce delivered directly to the homeless, to shelter kitchens and food pantries. For Kathy and Leo, it all began with Leo’s frustration having to load equipment and drive to a large lot they owned that needed mowing every week. 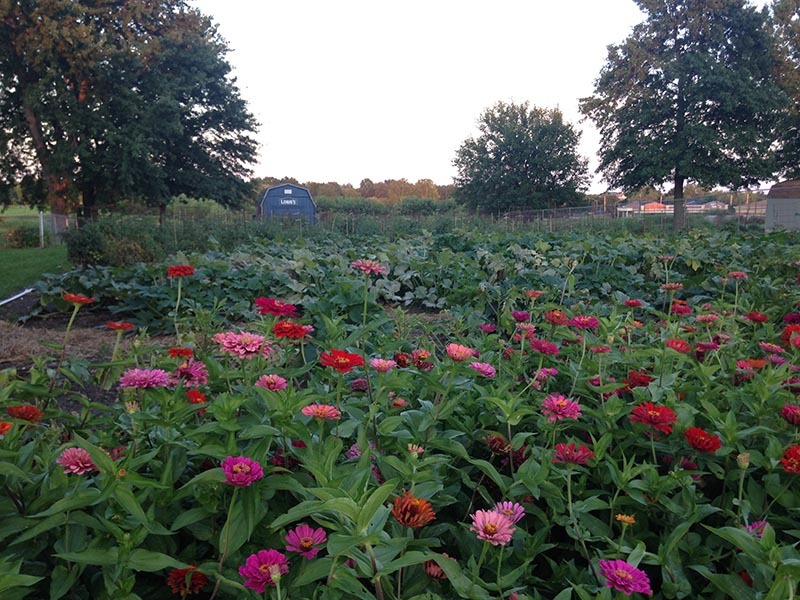 While Kansas City Community Gardens offers hardy seedlings grown in their greenhouses for most vegetables, Kathy grows everything from seeds except the tomatoes. And that includes one of the most amazing stands of zinnias Kathy grows more than four feet high from seeds to add a little more beauty to her garden. The tomatoes and the corn (introduced last year) were exceptional yields added to 4,000-5,000 pounds of yellow and zucchini squash harvested from July to October from the garden, “bushels and bushels” of eggplant and more jalapenos than imaginable. Sadly, beetles ravaged the okra crop in 2017. “It’s just amazing,” Kathy says. 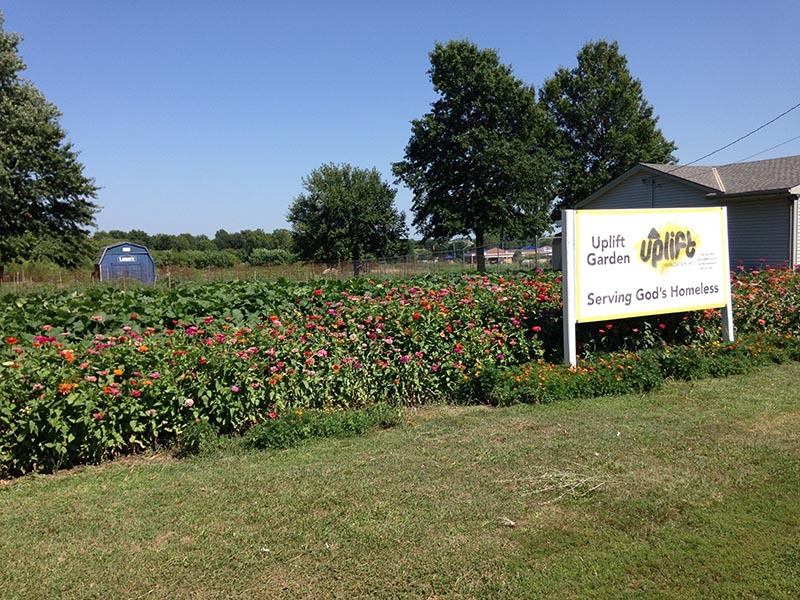 “For less than $5 for the seeds, we raise thousands of pounds of produce to give. KCCG members (with their discounted plants and seeds purchases) can plant huge gardens for nearly nothing. I just can’t say enough good about them. The seed quality is so good. “I had no idea the number of people that this little garden could help when I first began, but it has been such a blessing to watch it grow and to see the results each year,” she said. The KCCG plants and seeds are such high-quality that production often exceeds expectations. The harvest has become so bountiful Kathy has had to reach out to another community organization – After the Harvest – that can dispatch volunteers to help pick and deliver produce to food pantries, homeless shelters, soup kitchen and low-income housing centers. 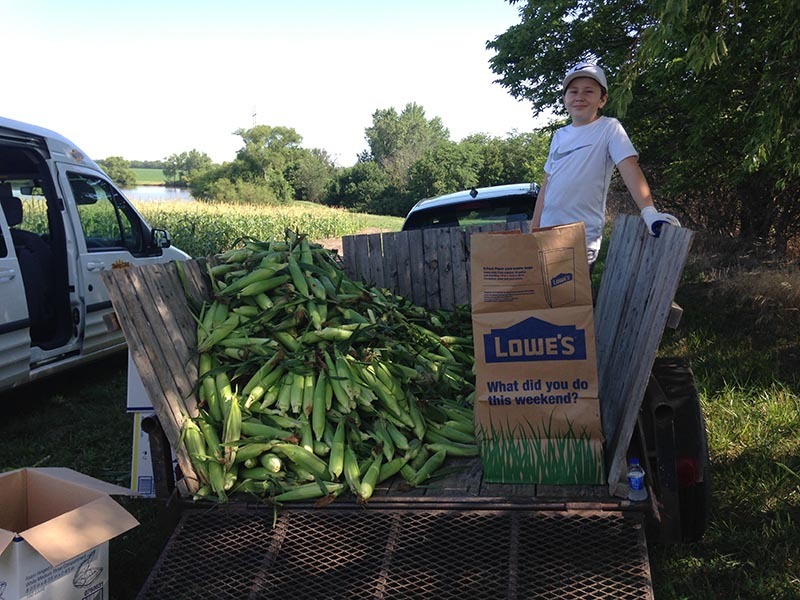 The organization’s volunteers picked some 10,000-12,000 pounds of sweet corn for Harvesters after Leo had harvested nearly 6,000 ears of corn from their first effort at growing corn. Kathy and Leo and their grandchildren are looking forward to their ninth year of gardening to make a difference for people in Kansas City. Previous StorySchoolyard Gardens Celebrates 10 Years!